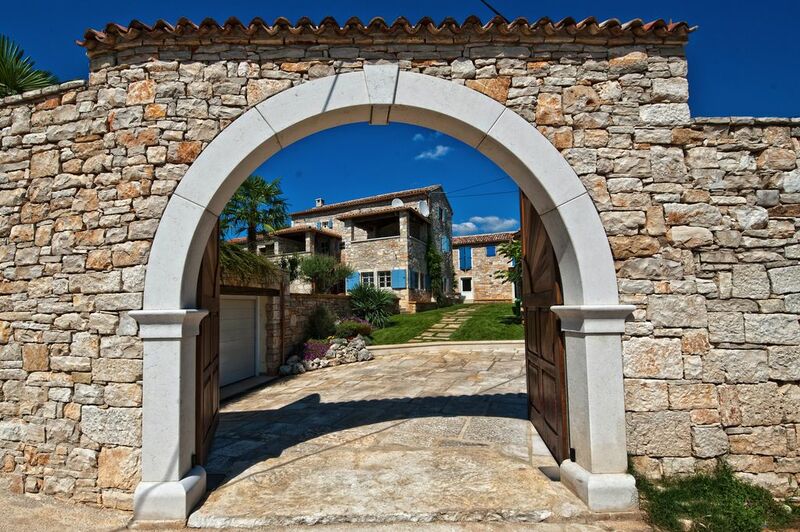 Villa Nicole is a beautiful, secluded property, located on a 1200m2 plot. It is located in the village of 10 houses and is therefor perfect for escaping the hustle and bustle of modern life. The place is also spared by passing cars, since it is located on a side street. Nevertheless it is not far from the popular tourist destinations, Porec, Rovinj and Vrsar and is also within easy reach of the A9 motorway exit. Also, many popular tourist attractions, such as the Baredine or the picturesque town of Motovun, where every year the famous film festival takes place. In addition, annually held on the 3rd october weekend, there is the international Prosciutto exhibition in honor of St. Simons in the 3km distant Tinjan. Otac Liborio is a beautiful, in 2013 renovated yacht, that carries comfortably about 12 people and 9 sleeps. With 4 cabins + saloon, 2 indoor and 2 outdoor showers, air conditioning and satellite television (42 inch LED) a comfortable boat ride stands nothing in the way. Of course, the kitchen is fully equipped. We offer our guests the opportunity to experience the western coast of Istria from another side. Whether you are fishing, water skiing, diving or just want to swim, Otac Liborio and his staff make everything possible. In a 7-day booking you even have the option, to explore the whole Adriatic coast with its many beautiful islands. We are 2 siblings and both still go to university. However, we additionally administrate not only our family house, but also Villa Nicole and Otac Liborio. Our parents gave us the confidence to believe in our entrepreneurial spirit and always help us with words and deeds. As a big sea-enthusiast, I always wanted an own yacht. 2012 this dream came true, when I bought Otac Liborio. Since I also love manual work, it was a really exciting task, to let this boat shine in his old glory. Prices shown are in euros for the two houses together. If only one house wanted please contact us. Weekly price includes: garden and pool maintenance. For Christmas and New Year bookings please contact us for prices. A non-refundable 30% deposit of total rental booking. The booking remains open until the deposit money is received. Should the balance paid not less than 8 weeks prior to arrival. Should you arrange your own cancellation and holiday insurance. Money to be paid by electronic bank transfer. A security deposit of € 500 is required at time of booking to be held against any loss or damage caused to the property or its contents. Should you arrange your own cancellation insurance. We celebrated my dad's 80th birthday with a group of 11 family members from 8 - 80. The layout and facilities of the house(s) were perfect to allow everyone their space, and the addition of a barbecue party room was luxurious. When the huge gates closed round the walled garden, we were in our own glorious world, complete with pool, jacuzzi and sauna to keep everyone happy until the next meal on the huge barbecue grill. Marko, the owner, was never more than a quick call away, and super helpful. In short, we loved it, and would recommend it wholeheartedly to anyone. If I would like to describe my Villa myself, I could not do it any better .So I thank You very much. Wir waren bereits bei der Ankunft von der Größe, Lage und der Ausstattung begeistert. Die Zeit in der luxuriösen Villa verging leider viel zu schnell. Die komplette Anlage ist äußerst gepflegt und in einem sehr guten Zustand. Der freundliche Kontakt zum Vermieter war zuvor und während des Aufenthalts sehr lobenswert, da er bei Rückfragen immer erreichbar war. Wir hatten alles in allem einen angenehmen Urlaub. Das Anwesen ist sehr schön angelegt. Schon alleine das Eingangstor ist grandios. Wir fanden alles sehr sauber bei unserer Ankunft vor. Die Kommunikation mit dem Vermieter hat per Telefon prima geklappt. Wer großen Wert auf Multi-Media im Urlaub legt ist hier richtig, es gibt sogar in jedem Schlafzimmer ein TV-Gerät. Leider ist der Pool sehr kalt und der Whirlpool bleibt, trotz Solarheizung, kühl. Das ist sehr schade, da wir uns im Vorfeld besonders auf den Whirlpool gefreut hatten. Dafür auch den Stern Abzug. Die Sauna ist super und bietet gerade bei eher wechselhaftem Wetter angenehme und entspannte Urlaubsstunden. Die beiden Küchen sind mit einer Vielzahl unterschiedlicher Herdplatten ausgestattet. Gas, Elektro, Edelstahl-Grillplatte, usw. - alles dabei. Der in solchen Ferienvillen normalerweise übliche Grundstock an Gewürzen und anderen Dingen ist tatsächlich nicht vorhanden. Also daran denken und Gewürze, Essig, Öl, Putzschwämme etc. selbst mitbringen. Sehr schönes Haus im rustikalen Stil mit Top-Ausstattung. Wir hatten einen super Urlaub und waren rundum zufrieden. Besonders zu erwähnen ist das der Vermieter sehr bemüht und schnell auf Nachfragen und kleinere Probleme reagiert. Die Unterkunft liegt zwar nicht direkt am Meer, aber dennoch sehr zentral. Je nach Strand braucht man ca. 15 - 20 min zum Meer. Kleinere Ausflüge ins Landesinneren (Motovun, Pazin dort u.a. Zipline) sind schnell zu erreichen. Auch in Rovinj, Pula und Brijuni ist man schnell. Von uns gibts volle Punktzahl. Danke!!! Das Haus an sich ist sehr schön und wir hatten auch einen schönen Urlaub. Obwohl wir beide Häuser gebucht und bezahlt haben, durften wir nur ein Haus benutzen, da wir mit 2 Personen weniger angereist waren. Dort mussten sich dann aber zwei Paare ein Bad teilen. -Das die Fön s nicht funktionieren ,wusste ich nicht ,werde nachprüfen und Tauschen. In den Töpfen bei den Palmen sind 20 verschiedene Gewürze gepflanzt ,sind Frisch und für würzen gedacht. In a 7-day booking you even have the option to explore the whole Adriatic coast and its beautiful islands.